BEST FIGHTER FOR CANADA: Is there more to a Boeing/Saab partnership than simply a trainer? Is there more to a Boeing/Saab partnership than simply a trainer? Take out your tin-foil hats, it's time for some wild conjecture. Previously, we looked at reports that Saab and Boeing are joining forces to offer a bid for the USAF's T-X program. Most likely, offering a decontented two-seat Saab Gripen as a contender to replace the aging T-38 Talon trainer. The move makes sense for all the parties involved, Boeing gets to offer a high performance, low maintenance airframe; while Saab manages to sell more Gripens (or derivative thereof) than it ever would have been able to on its own. Additionally, the USAF gets access to a worthy platform capable of preparing pilots to fly the F-35, F-22, and possibly whatever other manned fighters the USAF introduces in the next 30-50 years. But it doesn't stop there. The winning contender for the T-X program will likely find itself performing other roles besides simply preparing pilots to fly high performance jets. It will also likely be used as a mock adversary during aggressor training (think Top Gun), as well as a "companion trainer", allowing pilots of high-dollar aircraft like the F-35 and F-22 to keep their flight hours up and practice manuvers on a much more affordable airplane. It's that last sentence that really stands out. If the Boeing/Saab Gripen trainer wins the T-X competition, there may be a push to see the Gripen replace aging F-15 and F-16s in the Air National Guard. That's right, American Gripens in a combat role. But the Pentagon has gone "all in" on the F-35, hasn't it? Not so fast. Sequestration has hit the U.S. military hard, and there simply aren't any sacred cows anymore. Tough decisions will have to be made. U.S. Navy brass may soon find themselves needing to retire aircraft carriers in order to afford a full allotment of F-35Cs. The USAF may find itself in a similar pickle with its Next Generation Bomber. Although the Pentagon has made it clear that the F-35 is a "top priority" for them, the possibility of cuts or outright cancellation is very real. But what about all those other countries waiting on the F-35? Well... Times are tough all over. The Netherlands' Joint Multi-Purpose Support Ship. Up for sale before the plastic comes off the seats. 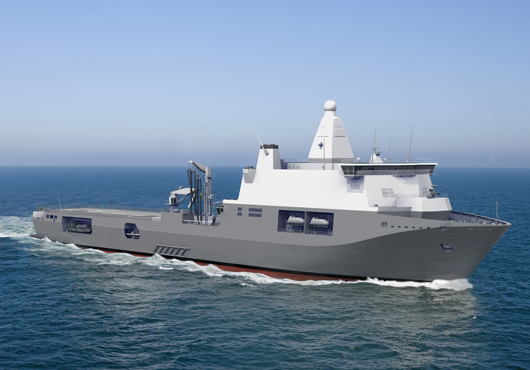 The Netherlands has capped its JSF acquisition budget to $4 billion, and that's after putting their brand new Joint Multi-Purpose Support Ship up for sale. It's first two F-35As have already been delivered... And then promptly put into mothballs. Despite Italy's role assembling the F-35 for European markets, austerity measures have forced Italy to already cut its proposed order once, and it may do so again. Denmark is reviewing its choices after years of delays and growing costs in the F-35 program. The U.K, the JSF's biggest investor apart from the U.S, still isn't sure how many F-35's it wants to buy. South Korea sent a very clear message when it disqualified the F-35 from its K-X competition when Lockheed could make no guarantees that it could provide 60 fighters under the allotted $7.4 billion budget. Despite rumblings that the F-35 is still the heir apparent for the CF-18, the current Conservative government has made quite a show out of hitting the "reset" button on the purchase. It has also been quite adamant that it will stick to its $9 billion acquisition budget. Doing so, it is now taking a closer look at the options available. Initially, this included the Lockheed F-35 Lightning II, Eurofighter Typhoon, Dassault Rafale, Saab Gripen, and the Boeing F-18E/F Super Hornet. Surprisingly, Saab declined to participate in the "reset", despite previously doing so before the initial F-35 announcement. The reason given was that they were not convinced that the process was fair and open, and stated that they would be more than happy to enter a bid if a full and open competition was declared. Meanwhile... Boeing has been aggressively pushing its Super Hornet as a cheaper and proven alternative to the F-35. Even more so with a new batch of features currently in testing, including conformal fuel tanks (CFTs), a stealthy weapon pod, and a modernized cockpit. This "Super Duper Hornet" would be stealthier, longer ranged, and sport a much more advanced set of sensors. But wait... Getting back to the Boeing/Saab T-X partnership, an official declaration is expected in "weeks, not months". This likely means that Boeing and Saab have been discussions for several months, if not several years. This means that Boeing and Saab knew that it was very likely for them to be competitors as well as partners. Here's where the wild conjecture starts. 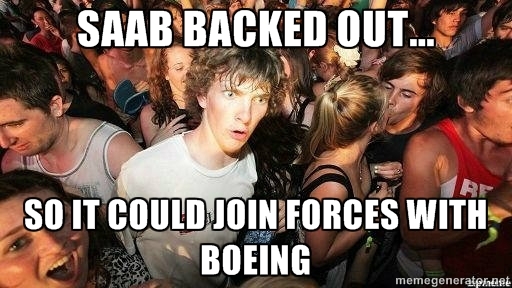 Boeing and Saab marketing their respective fighters all over the globe lately. Despite a few small victories (Switzerland for Saab, Australia and South Korea for Boeing), neither has enjoyed great success. Most potential sales are lost to the juggernaut that is the F-35, while others have been lost to the Dassault Rafale and Eurofighter Typhoon. There is still the potential for huge sales, however. Some countries, like Brazil, are still in the process of deciding on their next jet fighter aircraft. In other nations, delays, cost overruns, and uncertainty about the JSF has led to governments taking a second look at other aircraft, either as a cost saving measure, or as a potential back-up plan if the F-35 gets cancelled altogether. In many of these markets, the Saab Gripen and Boeing Super Hornet are in direct competition with other. Both are touting their low cost as their biggest benefit, but their perceived weaknesses (the Gripen's small size and payload, the F-18Es lack of high speed performance) stand out when compared to the more expensiveTyphoon and Rafale. But what if Boing and Saab joined forces and offered a combination of its two fighters? The two fighters compliment each other quite well. The Gripen is a small, scrappy and fast point defense fighter, capable of Mach 2, supercruise and high agility. The Super Hornet, while slower, is much more of a "work horse", capable of heavier payloads and additional duties. It is also compatible with carrier operations and offers the perceived safety advantages of having two engines. Both use variations of the same engine, both use the same weapons (apart from the cannon) and a joint venture between the two manufacturers would likely result in further commonality in the future. Both jets are already less expensive to fly than the competition, and their low cost per flight hour, combined with a common supply chain, could help offset the added cost of using a two fighter fleet. Consider Brazil, which is currently in the process of deciding between the Saab Gripen, the Dassault Rafale, and the Boeing Super Hornet. All three fighters have been declared the apparent winner at some point, but no official announcement has occurred, and Brazil's government has dragged it feet on the decision. Not only are there cost concerns, but Brazil has an aircraft carrier in need of aircraft as well. While Saab has promoted a navalized version of the Gripen, such a beast only exists as a concept at the moment. Both the Rafale and the Super Hornet were built with carrier operations in mind, however, and both have a proven track record. The Rafale seems like a good choice, but it is by far the most expensive of the three, both to procure and to operate. By joining forces, Boeing and Saab could not only offer a proven carrier-based fighter in the F-18E/F, but Boeing's expertise in designing carrier-based aircraft would help mitigate the risk of developing the "Sea Gripen". But what about countries without an aircraft carrier? Times are still tough, and budgets need to be reigned in. The world is still a dangerous place, however, and air forces are unwilling to sacrifice capability for costs. 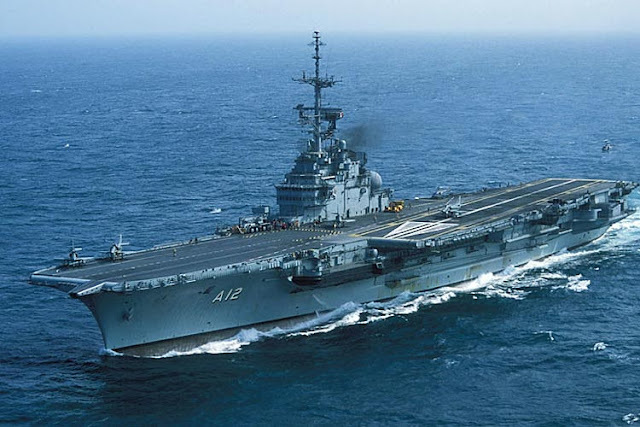 The recent "pacific pivot" has placed a greater emphasis on navy and air power. Armed forces will need to take care in how they spend their money. Canada still has the challenge of protecting the sovereignty of the second largest country in the world, much of that land mass over inhospitable arctic terrain. It must also keep up with its NATO commitments, as well as assisting its allies. Buy a fighter, get an aerial tanker for free! 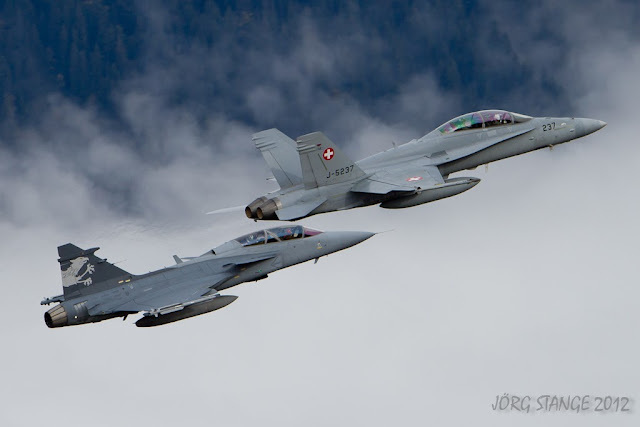 I've brought up the possibility of a mixed Gripen and Super Hornet fleet for Canada before. 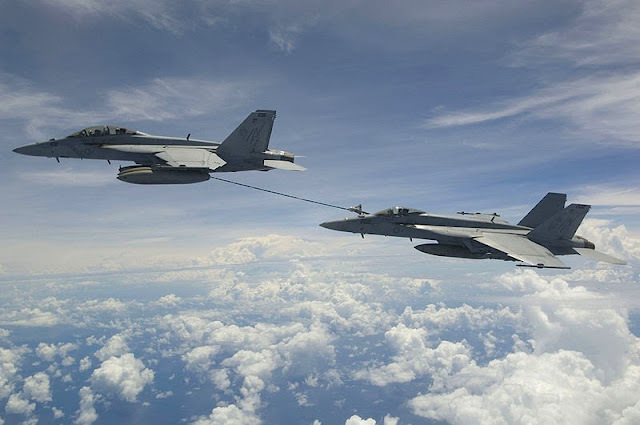 The robust Super Hornet's payload, as well as its versatility as a "buddy tanker", combined with the availability of the "Growler" electronic warfare (EW) variant makes it a great addition to any fleet. Meanwhile, the Gripen's versatility in operating from short airfields, ease of maintenance, and high "bang-for-the-buck" make it attractive as well. A fast, lightweight fighter, able to punch above its weight, combined with a robust, rugged fighter capable of serving double duty as bomber, tanker, or EW platform. Both offered at a low cost, backed by an American aerospace giant (Boeing) as well as a scrappy Swedish company known for its innovation (Saab). Could an "Advanced Super Gripen" with external weapons pod be possible? 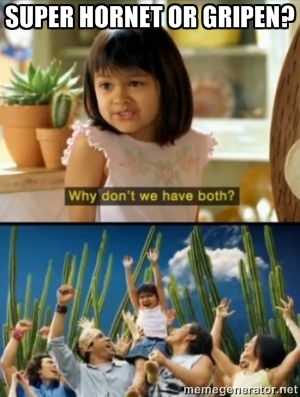 A bid offering a mix of both jets would be incredibly hard to ignore. Especially if Boeing decided to add some of its "Advanced Super Hornet" features to the Gripen; such as the enclosed weapons pod and spherical missile warning system. By offering a mix of Gripens and Super Hornets, Saab and Boeing could easily steal F-35 sales away from prospective buyers having second thoughts. Not just a few buyers here and there, but possibly even the USAF, USMC and USN. There's already blood in the water. Joining forces in offering an alternative could be prove to be lucrative indeed. previous post, there would be a “gap” between the production in USA of a trainer version and a combat version for Gripen… which could be conveniently filled by a significant U.S order for National Guard! The Saab move in Canada, just a few months before the partnership announcement with Boeing, is indeed “suspicious” to say the least. That’s not coincidence in my opinion. above a given quantity, the low CPFH of the Gripen compensates. less expensive to fly than the competition”, I think we can’t be that fast about the Super Hornet. The link to Janes study is interesting in that matter. It shows that CPFH can largely change depending of the experience with the type and the quantity fielded. Hence a significant CPFH difference between 500 U.S Navy Super Hornet and the small RAAF fleet. Study also states a link between size and CPFH, especially for fuel usage, which is estimated at 20-25% of CPFH composition. Unless we give 36 Super Hornet and 36 Rafale to Brazilians and see which is the cheaper to maintain, I will continue to believe that a 4 tons penalty for Super Hornet over Rafale can’t result in a significant Super Hornet advantage regarding CPFH. Consequently, the “The Rafale seems like a good choice, but it is by far the most expensive of the three, both to procure and to operate.” thing is only media rumors. borne jet, Rafale is in my opinion a very good choice. (especially because of strict export rules) so, as usual, wait and see.